1. Can I be in a parade? There are so many parades during the Carnival season that you might think there would be a lot of riding options. Well, there are a few, which I’ll describe, but they are limited. Parades are put on by “krewes.” Krewes are individual organizations. Some krewes, like Nyx, are newer and have an “open” membership, which means they accept new member applications. However, there are only a limited number of positions available, so you might have to pay to get on a waiting list and could be there for years without ever getting in. There are other open membership krewes you can check each of them out to see about availability. Other krewes are “by invitation only.”There are some other options for people who want to ride. There are parades such as the Krewe of Orpheus parade. Rides in this parade may be purchased as packages. Check out their website for more information. Another option that may be appealing is participating in a walking parade. There are many of these types of events that walk through the French Quarter and in other areas. Some of them include the Krewe of Barkus where you and your pet dress in costume and parade. Another is the Krewe of Cork where walkers enjoy wine as they stroll. There is also the Pete Fountain Half Fast Walking Club which starts at Commander’s Palace at 7 a.m. on Mardi Gras morning. You can also find some riding positions available on Craigslist. I recently saw a couple of positions on Orpheus available as a fundraiser for the local Parkway Partners. There are also “truck parades” that roll after Rex on Mardi Gras day. There is information about positions available there also on Craigslist. I understand that some krewes allow members to “rent” their position on a float if they are unable to ride. These apparently can also be found on sites like Craigslist. 2. Is Mardi Gras safe? – Many parades during Carnival are quite safe and family friendly. 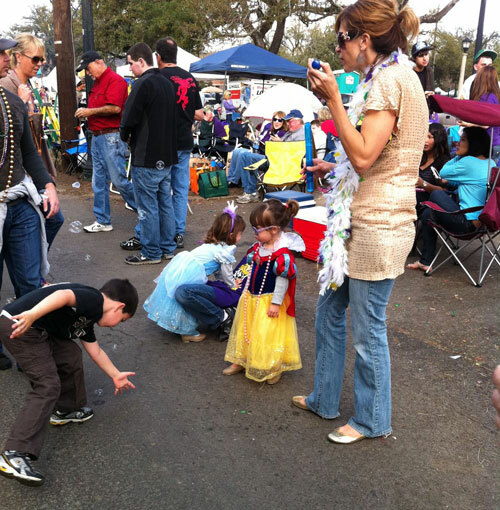 The daytime parades are always lined with kids on ladders reaching for beads and other throws. Most families watch the parades from there spots uptown. Night parades are some of the most beautiful and spectacular with flambeaux and lights. Just keep your eyes open and be aware of your surroundings. 3. What is the difference between Carnival and Mardi Gras? – Mardi Gras is one day. 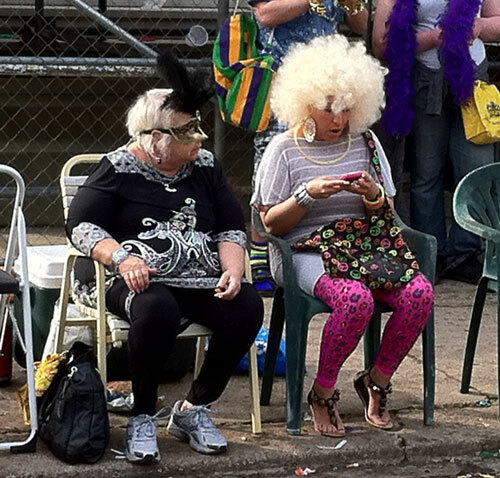 Mardi Gras actually means Fat Tuesday. It follows Lundi Gras, which means Fat Monday. 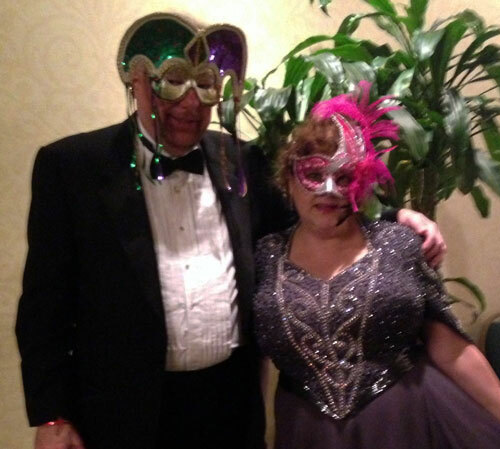 Carnival is the time between Twelfth Night or Epiphany and the beginning of Lent which begins at midnight on Ash Wednesday (following Mardi Gras). 4. What are throws? – Throws are what parade riders throw to parade watchers. They include beads, go cups, doubloons and light up trinkets. Most krewes have signature throws. Some of those include purses from Nyx, shoes from Muses and coconuts from Zulu. Some of my favorite throws come from Rex. They parade on Mardi Gras day and each of their beautiful floats has a different signature throw that matches their theme. 5. How much do parades cost? – All of the parades are free to attend. It is called the “greatest free show on earth.” No one organization runs Mardi Gras. 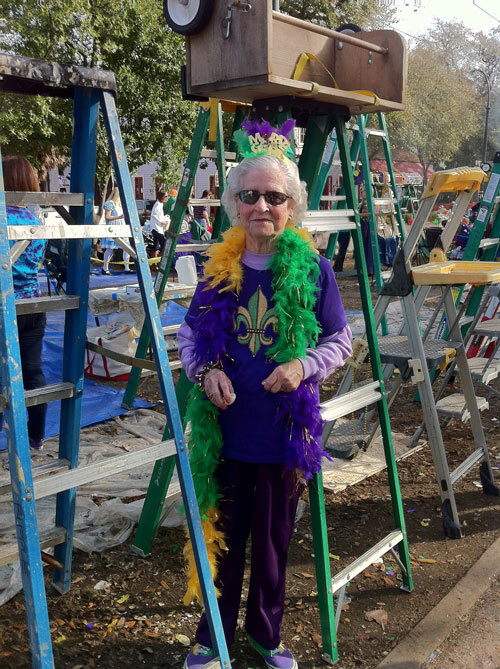 Each parade is put on by an individual krewe. 6. Do you need to have a costume for parades? – You do not have to have a costume, but many people do. Some people plan their costumes all year long, while others just throw something together at the last minute. Costumes can be very elaborate or very simple. Riders in parades on the other hand are required, by law, to wear masks on the parade routes and may be fined or removed from the parade if they take their mask off. Well, those are the answers to some of the questions I have been asked. Obviously, this could turn in to a book. There is so much tradition, pageantry and fun associated with Carnival. Hope you can make it to Carnival and have a blast! Do you have any questions or anything you would like to add to these answers. Love to read your comments!